Chuck Avery of Avery and Brook, Grand Rapids, Michigan decided to check some of his new stock for varieties and found a 1900 Morgan silver dollar with a doubled die reverse that is now listed as a new VAM variety. 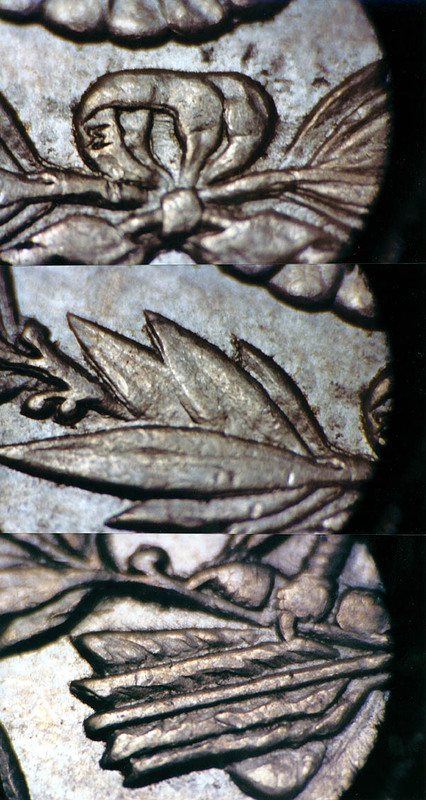 VAM is the acronym that prefixes the listing numbers for die varieties listed in The Comprehensive Catalog and Encyclopedia of Morgan & Peace Silver Dollars by Leroy Van Allen and A. George Mallis. VAM represents the initials of the authors’ last names. This listing system is also used for new variety listings that are candidates for inclusion in any future editions of the book. Complete details of this story can be found in my Varieties Notebook column in the November 7, 2005 issue of Coin World. Unless otherwise stated, all Photographic Images are by Ken Potter. Copyright Ken Potter, 1993 - 2006. Use of images in any manner is strictly prohibited without the express written permission of the copyright holder.